Suitable for screen-printing substrates in Film/Sheet/Board form. Ex: Stickers, Decals, Posters, Nameplates, Dash Boards, Printed Circuit Boards, Membrane Switches, ELs, FPD Film/Panels, etc. 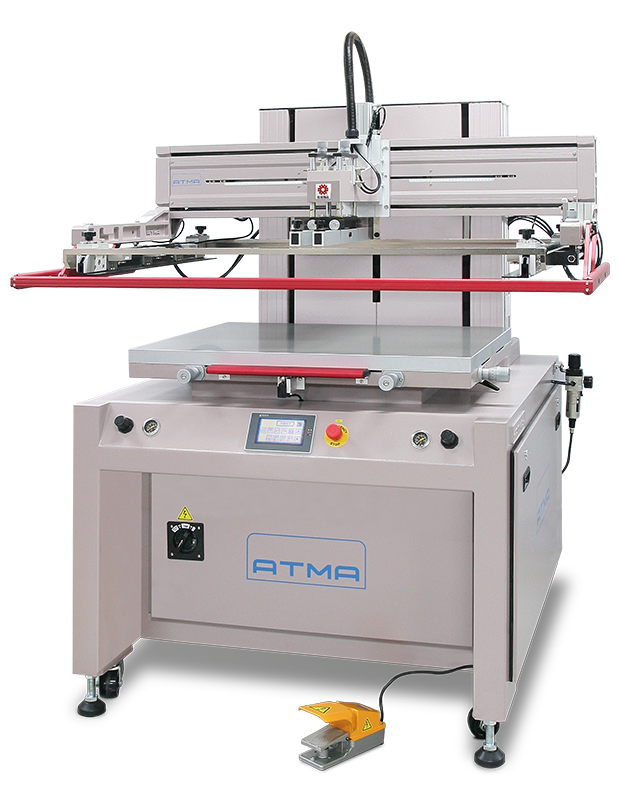 Semi-automatic: hand load / hand off-load with controlled automatic printing functions. HMI digital touch screen panel provides user-friendly control with multiple printing functions and operating parameters including presetting throughput of current yield along with built-in error diagnostics. TABLE SIZE (D x W) 700x900mm 27½"x35⅜" 800x1400mm 31½"x55⅛" 800x1700mm 31½"x66⅞"
VACUUM AREA (D x W) 600x800mm 23⅝"x31½" 700x1300mm 27½"x51⅛" 700x1580mm 27½"x62"
MAX. PRINT AREA (D x W) 600x800mm 23⅝"x31½" 700x1200mm 27½"x47¼" 700x1600mm 27½"x63"
MAX. FRAME SIZE (O/D, D x W) 900x1100mm 35⅜"x43¼" 1000x1500mm 39⅜"x59" 1000x1900mm 39⅜"x74¼"
SCREEN FRAME HEIGHT 26~54mm 1.02"~2.12" 26~54mm 1.02"~2.12" 26~54mm 1.02"~2.12"
SUBSTRATE THICKNESS 0~25mm 0~1" 0~25mm 0~1" 0~25mm 0~1"
SCREEN-UP CLEARANCE FROM TABLE 300+25mm 11¾"+1" 300+25mm 11¾"+1" 300+25mm 11¾"+1"
PRINT HEAD SPEED 0~835mm 0~33" 0~835mm 0~33" 0~835mm 0~33"
SCREEN X / Y ADJUSTMENT ±10/±10mm ±⅜"/±⅜" ±10/±10mm ±⅜"/±⅜" ±10/±10mm ±⅜"/±⅜"
MACHINE DIMENSION (W x D x H) 150x130x170cm 59"x51"x67" 190x140x175cm 75"x55"x69" 230x140x175cm 91"x55"x69"
A.	German S.E.W. Motor powers screen up / down position. Provides high cycle speed with smooth mechanical movements, accuracy, and low noise. C.	Servo drives power travel of squeegee / flood on guided precision sealed linear motion bearings, reinforced tooth belt, timing belt wheel for high rigidity and ultra-smooth high print speed transport cycles without backlash. This ultra-smooth gliding of the squeegee / flood assembly enables step-less speed change for higher production speed, smooth operation, consistent / uniform printing deposit control, less maintenance and fast operation. P.	Highly efficient delta servo motor powers squeegee and flood coater with greater accuracy of speed range (acceleration and deceleration) 100-1000 mm/second. Direct numeric input of digital settings for stroke position through touch screen control.